Summon: +1/+1 and Guard if you have an Animal. Guar Stablemaster is a common Agility creature card. It is part of the Houses of Morrowind expansion. "Can I offer you some hackle-lo?" "They're worse than a mudcrab!" This card's summon ability applies the Content card effect. 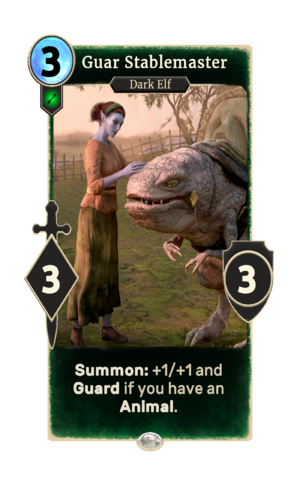 The card's art depicts Drulene Falen, who first appeared in Morrowind. This page was last modified on 2 March 2019, at 00:21.